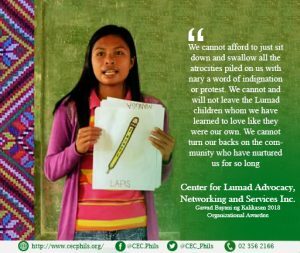 CLANS promotes the Lumad right to self-determination by supporting indigenous people’s movements to address the root causes of inequality, disrespect, injustice, discrimination and plunder of ancestral lands. It provides and facilitates extension programs and services such as education, community-based health care systems, sanitation programs, water systems, small-scale alternative electrification, irrigation systems, and sustainable agriculture to its partner Lumad communities. CLANS was an organizational awardee of Gawad Bayani ng Kalikasan 2018. Lumad rights advocates have complained of human rights violations allegedly committed by government troops in Tinagdanan, where many residents are members of the Kesasabanay Dulangan Manobo, a local organization that has been resisting the entry of DM Consunji Inc. in their ancestral lands within the Daguma Mountain Range, which stretches over parts of Sultan Kudarat, Maguindanao and South Cotabato. Intensifying attacks from the military and paramilitary groups are directed at CLANS to pacify their staunch opposition to the entry of mining and plantation companies in their partner Lumad communities. Even their volunteer teachers and staff members are experiencing intimidation, harassments, illegal arrests, and trumped-up charges. Teacher Jolita Tolentino, a lumad teacher was arrested in Sultan Kudarat province over murder and frustrated murder charges filed against her and several colleagues and community leaders over a clash between communist rebels and Marines last year that left one soldier dead and nine others wounded. PTCA member Pastor Kama Sanong was also arrested and remains detained after he was falsely charged with illegal possession of firearms and explosives. CLANS claims that Kalamansig Mayor Ronan Garcia is responsible for the arrest and false charges pressed against teacher Jolita Tolentino and Pastor Kama Sanong. CLANS also added that the mayor threatens to deploy Marines to the Kampuhan to disperse the CLANS and MISFI community. As of July 11, 2018, DepEd Region XII refuses to face CLANS. This has made them more vulnerable to attacks and harassment from the military especially under the existing Martial Law in Mindanao. According to Romero, that on July 9, 2018, three intelligence personnel infiltrated their camp and harassed a MISFI Academy student during a slogan-making contest for Nutrition Month.